Queen palms (Syagrus romanzoffiana) belong in the family Cocoeae and are Brazilian and Argentinean natives. Queen palms prefer living in the subtropical and tropical areas of the United States, thriving in warmer portions of USDA planting zones 9, 10 and 11. They are fast growers, quickly reaching heights of up to 50 feet with graceful flowing fronds. Gardeners living in areas prone to frosts and freezes should consider growing queen palms inside of containers. Queen palms tolerate growing inside containers quite well provided the container is large enough to house them. Select a container that has drain holes in it and is approximately three times larger than the queen palm’s root ball. Selecting a large container gives the palm’s root adequate room to spread out and cuts down on the frequency of repotting into a larger container. Fill the container half with a well-draining potting mix that has peat incorporated into it. Using a potting medium that holds water increases the possibility of the queen palm developing root rot. Incorporate a slow-release palm fertilizer into the container of potting mix before planting the queen palm. Pour the fertilizer into the container, per the package instructions, and work it thoroughly into the soil. Water the container before placing the palm into it. Remove the queen palm from its container and place it into the container of soil. Fill the container with the potting mix and firm up around the roots. Be sure to plant the queen palm no deeper than it was growing inside of the original container. Water the container, allowing the soil to settle around the queen palm’s roots and release any remaining air pockets. Add more soil if the soil settles below the palm’s root system and firm up again. Water the container again, allowing the water to run from its bottom. Continue watering the newly planted palm every other day for the first two weeks. Gradually begin tapering off the water to once per week as the queen palm establishes itself inside the container. Queen palms are relatively drought tolerant once established but will benefit from regular weekly watering. Situate the container in an area that receives full to partial sunlight throughout the day. Queen palms require some sunlight throughout the day for proper growth. They will not tolerate growing in full shade conditions. 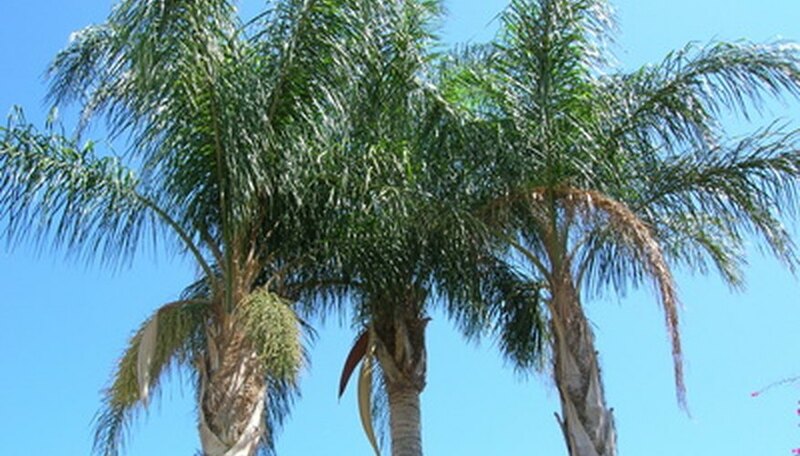 Protect queen palms from frosts or freezes by bringing them into a warm, protected area.